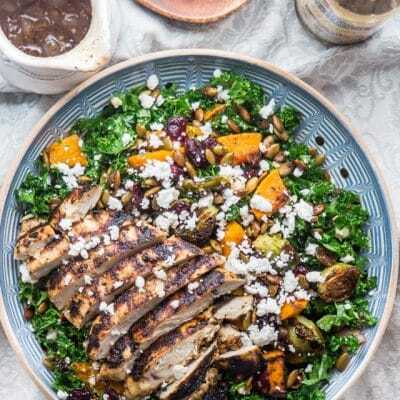 This Warm Kale Salad with Roasted Butternut Squash, balsamic vinaigrette, grilled chicken and sugared roasted pumpkin seeds is the best kind of comfort food perfect for cool autumn evenings! This post is brought to you in partnership with Litehouse Foods! Although I’ve been compensated for my time, all opinions are 100% my own. You all know I love my comfort food and that means good hearty and delicious meals. While we do make a lot of salads in my household, hubs is usually the salad guru and I am the grill master. However, when I do make a salad, I want it to stand out, I want it to be different from all other salads and I want it to fill me up and make me feel like I’m not really eating a salad, but something good, delicious, hearty and comforting. Which is what this crazy yummy salad delivers! I made this incredible salad using Litehouse Organic Balsamic Vinaigrette which I used two ways. First I marinated my grilled chicken in the balsamic vinaigrette for about half hour, which basically tenderized it a bit before grilling it. I also used the balsamic vinaigrette for making the dressing for the salad which I mixed together with some sautéed shallots and garlic. I’ll admit that there are a few steps to this salad, but trust me when I tell you each and every step is totally worth it. Yes, you can skip the roasted butternut squash with brussels sprouts, or you can skip the chicken or roasted pumpkin seeds, but then you’d miss out on all the things that make this salad great. I love roasted butternut squash and it’s so easy to make. If you hate peeling it and cutting it up, you can use the frozen one, or I know some grocery stores now carry it all cleaned up and cut into pieces. That will certainly save you some time. But I would totally go to the trouble of roasting it in all those great spices. I also added some brussels sprouts only because I love roasted brussels sprouts, but this is totally optional. The roasted pumpkin seeds with brown sugar and butter are truly out of this world. While they’re amazing in this salad, I love to make these just on their own and snack on them. So. Good. Just try them, you’ll thank me. 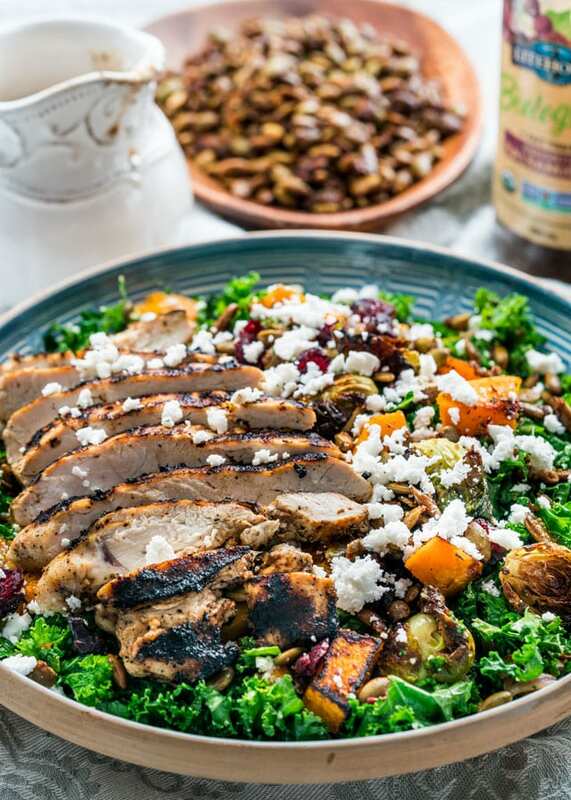 I love adding some grilled chicken to this salad, and the chicken is so flavorful from being marinated in the balsamic vinaigrette, but it’s up to you if you add it. I actually grilled this on a grill pan on my stove top, so it was really easy, didn’t have to heat up the grill or anything. You could even just cook it in a skillet. But let’s talk about kale for just a minute. I personally am not a huge kale fan mostly because whenever I eat it at a restaurant I feel like I’m choking on it. I have found out a way to make it so that I love to eat it and that is I give it a nice massage. I actually learned about this trick from my mother in law who makes a killer cabbage salad, and she massages the cabbage in some olive oil and salt until it’s nice and tender. Which is why I now do the same to my kale, first I like to chop it really nice and small then give it a good massage for about a minute with some good olive oil and a bit of salt. You will end up with nice and tender kale. So worth it. And lastly, all that’s left to do to this salad is assemble it all together and add some great feta cheese for saltiness and some craisins for a bit of sweetness. My husband who is quite the picky eater said that this was the best salad he’s ever had. Trust me, that was the biggest compliment I ever got. He couldn’t stop eating it, and those roasted pumpkin seeds were the bomb. 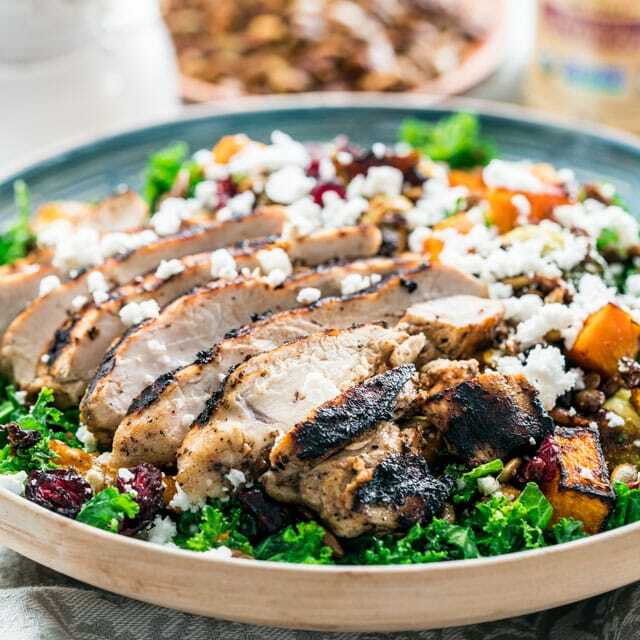 Not only is this salad so incredibly delicious, it’s so filling, you will actually walk away from the table feeling like you ate a huge steak and potatoes. I think that’s a good thing. If you love kale, try out my Kale Salad With Blueberry Vinaigrette! Preheat your oven to 400 F degrees. In a large bowl toss all the ingredients for the roasted butternut squash together. Place the butternut squash onto a large baking sheet and bake for about 20 to 30 minutes or until the butternut squash is golden brown. 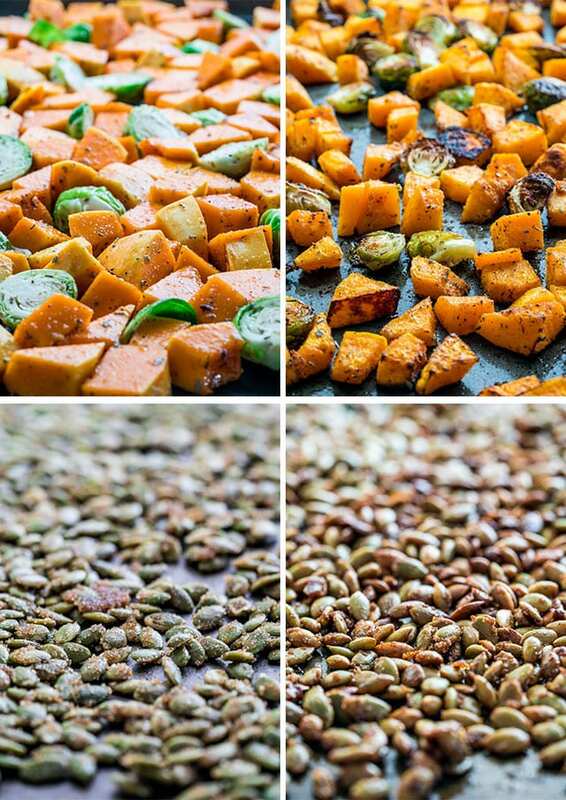 In a medium size bowl toss all the ingredients for the roasted pumpkin seeds together and transfer them to a baking sheet, spreading them so that they are in a single layer. Bake for about 10 minutes (still at 400F) or until they start to brown. 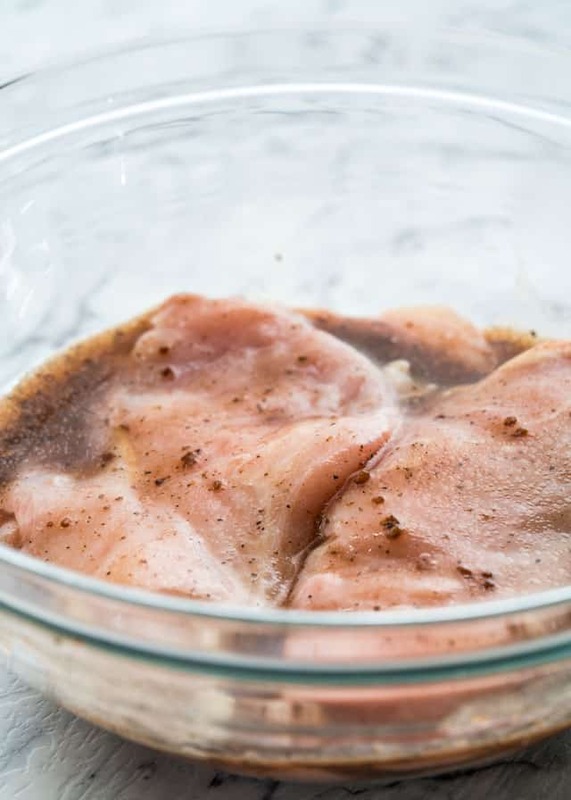 Place the chicken breasts in between 2 pieces of plastic wrap (or in a ziploc bag) and beat it with a mallet until it's about 1 inch in thickness. Don't beat it too long and make sure you don't tear the meat. Place the chicken in a shallow bowl or plate and pour the balsamic dressing over it, turning the chicken around to coat it on both sides. Let the chicken marinate for about half hour to an hour. Grill the chicken breasts. First brush some olive oil on the grill grates, then place the chicken and grill without moving, until the chicken starts to get grill marks and starts to brown. Turn over the chicken and finish cooking. Do not slice the chicken right away, cover it with aluminum foil and let it rest 5 to 10 minutes before cutting it. Melt the butter in a skillet over medium high heat. Add the shallots and garlic and sauté for about 3 minutes or until the shallots are translucent and the garlic is aromatic. Whisk in the vinaigrette and water and cook for 2 more minutes. Remove from heat. In a large bowl add the kale, olive oil and salt. Toss the kale really well with the olive oil and salt. I also like to rub the kale with my clean hands, giving it a good massage for about a minute. This will make the kale more tender. 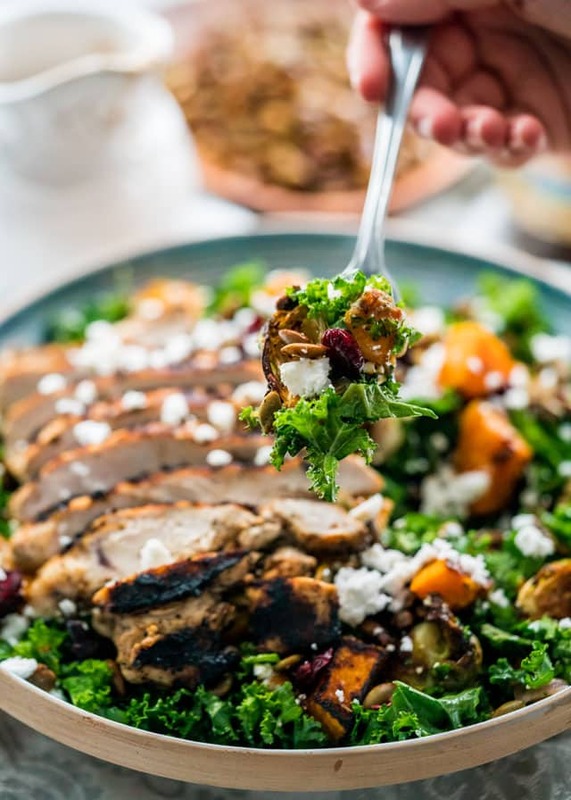 Add the roasted butternut squash, roasted pumpkin seeds, crumbled feta cheese, craisins, prepared dressing and toss everything well together. Slice the chicken and place over the top of salad. Alternatively you can toss the chicken in with the rest of the salad. You can also grill the chicken on a grill pan by brushing it with some oil first then heating it up on medium-high heat. When the grill pan is hot, add the chicken breast and grill on one side until you get nice grill marks and the chicken starts to brown. Turn the chicken breasts over and finish grilling on the other side. 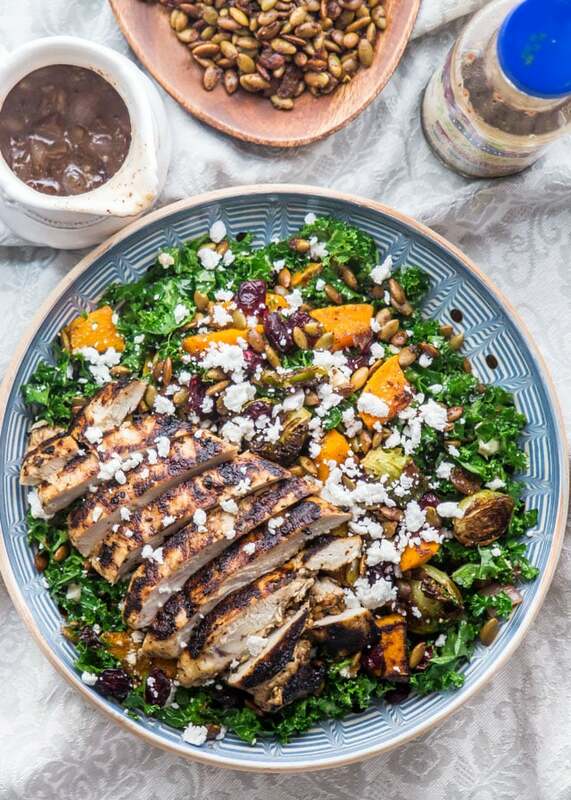 While the roasted butternut squash, the roasted pumpkin seeds or grilled chicken are elements of this salad that are optional, I strongly recommend adding them all to this salad in order to appreciate it fully. 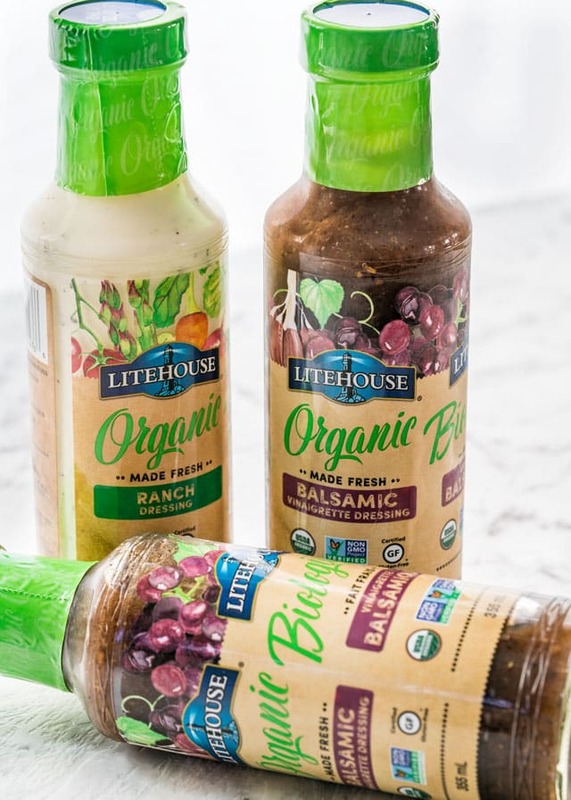 In celebration of September being Organic Harvest Month, I hope you give Litehouse Organic Salad dressings a try, they are Certified Organic, Certified Gluten-Free and Non-GMO. They come in a variety of flavors and have great taste and no high fructose corn syrup, no MSG and no artificial preservatives. You can find Litehouse Organic Dressings in the refrigerated produce section of your local supermarket. Okay this was SO worth the effort, best salad I’ve ever made.